Last October, I gave an Ignite talk at the Digital Media and Learning Conference called “Epic Composition.” Below, I offer a more extended look at the design and structures of my “jumbo” first-year writing course at California State University, Chico. Walking into our “jumbo” first-year writing course as an outsider can be a bit intimidating. The room is packed with people: 90 students, nine writing mentors, and the instructor. Students sit in new desks: rolling chairs with a bottom “saucer” for storing backpacks, a moving tray designed for a laptop. Students have nicknamed the chairs “George Jetsons.” These rolling chairs allow students to easily and seamlessly glide together across a low carpet in small and larger group configurations. Across laptops, tablets and smart phones, they talk animatedly about their weekends as mentors weave among them, participating in this opening class ritual. On a front wall are three large projection screens detailing opening instructions for the class. Throughout the class period, students move in and out of large and small configurations with their peers. They write together, move into small group conversations as they share their work. Later in the class period, they get out of their George Jetson chairs and onto the floor, crafting research questions together on poster paper. Some students grab a moveable whiteboard to share ideas with other groups in an impromptu gallery walk. Other groups work together to make meaning with a variety of texts they’ve selected for their research. They take turns documenting their work on social media platforms. Student tweets pop up on a Twitter feed projected in the front of the room, tracing the students’ conversations and making the ideas of the class public. Mentors weave through the groups, talking with individual students or giving directions to the group. As the class ends, the mentors huddle with their students, talking about students’ emerging ideas and reminding them of upcoming responsibilities. Our large-enrollment composition course was not occasioned by institutional pressures, not budget, not bottlenecks, not faculty shortages. It is not a scaled-up version of regular composition and does not take part in neoliberal projects of scaling for fiduciary efficiency. Instead, it was from the outset a design for better learning, better instruction that emerged from an “entanglement” of the institutional environment and intentional innovation. Three key structures support the overall design of the Jumbo: a small workshop (10 students led by a mentor) that meets “outside but alongside” the jumbo class, writing mentors who participate in the course, and digital platforms that create a virtual space to support student participation. In our class, the realization of competence, the offering of contributions from the students creates a swarm that generates not just a single identity, but a collection of identities driven by the desire to be scholars, to find out things, and to share their findings with colleagues. I also think of “epic” spaces as the difference between attending an intimate jazz club or a mega rock concert. Sometimes people want one experience — the intimate gathering with a few friends — and other times they want to feel part of a major event. But neither is more authentic, or affords more opportunities for engagement and learning, than the other. Both experiences — the small group and the large gathering — offer valuable ways of being and participating in a community. The primacy of the teacher and student dyad and the classroom as closed container fades in the jumbo and is replaced by a network: encounters and entanglements with other students, with mentors and professors, and with other university professionals, inside and outside the jumbo. The embeddedness in local institutional context makes the jumbo nonscalable. My colleague, Tom Fox, brought the idea of scalability to our discussions of the jumbo. He borrows this concept of scalability from Anna Tsing’s remarkable article, “On Nonscalability: The Living World Is Not Amenable to Precision-Nested Scales,” where she argues that the understanding of scaling — the movement of a project from one context to another with little change to the original (think McDonalds, Starbucks) is an under examined concept. Tsing shows that scaled projects are a capitalist fantasy, always transform themselves and their new contexts as they move, often by destroying environments, cultures, and people. Scaling, a process through capitalist projects (say “Composition”) are reproduced in ever expanding contexts with little or no change to the original. We use Tsing’s ideas to counter the argument that our jumbo is a “scaled expansion” of Composition and argue that the learning we offer is about the richness of nonscalability. What drives the energy of the jumbo is the number. Tony Sampson, in his book “Virality: Contagion in the Age of Networks,” cites a Stanley Milgram experiment: If one person looks up at the sky, 20% of passerbys also look up at the sky. If five people look up at the sky, 80% of passerbys look up at the sky. Sampson comments, “the individual makes a contagious assumption based on the quantity (my emphasis) of evidence that there is something worth looking up at.” In a similar way, the quantity of students who embrace the jumbo increase the virality of the experience. This explains the high pass rate and the general “this is worth my time” attitude of the students. Students enter a space that offers complex and extended attention to multiple ways to participate. A question driving the design is: “Are multiple ways of being and identities offered, supported, and celebrated?” I hope students extend a sense of self like that of a “successful college student” to something deeper: an identity as a scholar and member of a team of scholars. I argue that the large class affords the construction of a scholarly identity, an identity that was always already there, but untapped and unnoticed. The students are recognized as scholars, thinkers, writers and this recognition comes from relationships they value, from their mentors, the faculty, but more importantly, from their large number of peers. The virality of the jumbo emerges from this mix of spontaneous encounters, designed social spaces, and shared desires. An iterative social practice in the jumbo is to model and create noticing. I was concerned at first, at the possibility of students feeling lost in the numbers. That has not proved to be a problem: routines in the classroom set up noticing. We create structures — small teams, public blogs, consistent exchanges of student work, featured work — which model and support noticing. The experience of being noticed, either by the professor, the mentor or a peer, in a class of nearly 100 is more powerful than being noticed in a class of 20. As an example of one structure that supports, and more importantly, makes noticeable, the scholarly work of students, I ask students to participate in a “Review Board.” Each workshop team sends a representative to meet with me for an hour outside of class time each week. The Review Board is responsible for reading the work of their peers and nominating a writer to be featured in class. We end up with nine featured writers — one from each workshop — and we pick a few to talk about in the large class. The review board’s job — back in the large class — is to present the writing, talk about why they think it represents some of the best thinking that week, pose questions to the featured writer about her choices, and celebrate their peers. I am always impressed by this small Review Board team: without prompting they will often ask “what was the purpose of the writing this week?” Or they will say, “we featured her work last week; we should make sure someone else is featured.” The students recognize that the writing is intentional and that we value the ideas from as many students as possible in our class. Each week, a new batch of scholars emerge and are highlighted in our space — and over time — we build a community where the students are noticed. 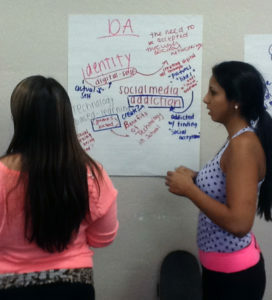 Pedagogical practices such as this — the curation and publication of classmate’s work by classmates — contribute to students being entangled in each other’s work, creating contagion where students pursue inquiries of their own design, inquiries that matter to them and begin to matter to their classmates as well. It’s the collective force — the numbers — that make this powerful.